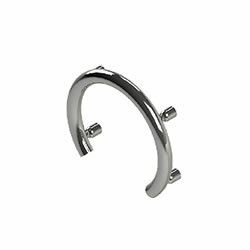 Accent ring with integrated grab bar, available in Polished Chrome, Brushed Stainless, Matte Black, and Oil Rubbed Bronze. Invisia Accent Ring is a decorative grab bar that elegantly frames your shower valve while providing support when accessing controls. Discreet wall stems with concealed screws: Meticulously designed wall interface stems render screws and mounting areas virtually invisible and allow the Invisia Collection to naturally blend within its environment. Materials / Finishes: Brushed Stainless Steel, Chrome, Matte Black, or Oil Rubbed Bronze. Note: The Invisia Accent Ring should only be installed in areas where the mounting surface is structurally sound. If you are not equipped to undertake the outlined work we recommend that you have your Invisia Accent Ring installed by a qualified contractor. The Invisia™ Accent Ring must be secured to wall with fasteners appropriate to the structural material. Fasteners must be rated for certain retention force each for maximum weight capacity. Mounting fasteners should be inspected monthly and tightened if necessary.